Introducing GameSalad Creator Mac 0.10.0 Beta — Welcome to the GameSalad forum! Today, we're launching GameSalad Creator for Mac 0.10.0 Beta. Included in this release are some much needed fixes, along with a powerful new feature – Web Publishing – that will greatly increase the speed, reliability, functionality and flexibility of publishing with GameSalad Mac Creator. Concurrent with the release are a number of other changes, which we’ve worked to message out to the community over the last week. The transition to web publishing brings several important changes to the community. Most notably, in order to manage our web and server resources, we will sun-setting the ‘old publishing’ system. GameSalad Mac users will have 30 days to upgrade to 0.10.0. It is important to know that games published through the old publishing system will not show up in the new web publishing game portfolio. In order to bring your previous games into the new portfolio system, we encourage users to republish games under the new web publishing system. Also, as previously discussed (link to forum) with 0.10.0 we will be introducing a new Dashboard in Mac Creator. Moving our publishing flow to the web required us to drastically alter the way Creator and our publishing servers speak to one another. Unfortunately, this has also affected the way the dashboard accesses the servers where Community-built templates are stored and processed. As a result, access to the full library of Community- built templates is temporarily unavailable. As announced last Friday, we have removed Kiip services and behaviors from the Creator and publishing flow. Kiip will continue to function in games already published through October 31, 2012. Final payments for Kiip will be processed by the end of the calendar year. For more info on the removal of Kiip, please view our forum announcement here. You may have noticed we’re using a slight different numbering system with this release. This changes' intent is to bring both Mac and Windows creators into closer alignment. For example, you will be able to tell when tools are compatible if the middle number is the same. Most important, however, is that this change does not alter the timeline to "GameSalad 1.0" in any way. For more info on the changes to our Version numbering, please read our Forum post here. In keeping with Apple's requirements, after this release we no longer support Snow Leopard or older OS's. This also means that all 32 bit support will be dropped, and users must utilize a 64 bit processor going forward. As this is Apple mandated, we hope that you understand the necessity behind this change, and we apologize for any inconvenience this may cause. GameSalad Creator for Mac 0.10.0 Beta also includes a number of fixes. Notable fixes include: Mac App sandboxing, iPad retain and Mac retina icon fix, Mac OS X retina support, Kindle resolution support (black bar issue), retina Splash screen support, and "Blurry text" addressed. A complete list of all fixes and changes can be found in our full Release Notes. We're also still hard at work at our Native Code engine, as well as continuing the tweaking and migrating of our Windows Creator interface into the Mac Creator. Note: The "Blurry text" fix is essentially display text retina support for iOS devices. Mac does not yet have this implemented. Three cheers for retina splash screens! (though I just submitted an app today d'oh!) And did I just read retina display text? (I just made several hundred retina images today to replace the display texts I was using, double d'oh!) Great job anyway! Woohoo! Glad for this. Just sent in a report to support though, cause I'm still getting Blurry text when testing on my 4S through the Viewer. I will do an AdHoc and see if the results are the same. I believe it was a binary fix, @Uptimistik - though I may be off. Try it in ad hoc. Team is looking into it, @Uptimistik. @dumbstudios haha yes it does. I mentioned that already to them in my support ticket. Hmm.. Seems that when I click to go into a scene that the scene is black and you cannot see your actors....If you scroll in your scene everything appears as it should. @dumbstudios - I'm not sure that particular message is dynamic (in terms of it recognizing your Pro status). But I've noted it! Hot dippity dog! The Retina Text Display works perfectly in Ad-Hoc! WOOHOO!! This is big. With Custom Fonts we can rule the world! @uptimistik Thanks for confirming it. @SSS Thank you Sir. I tried login off and login back in and still shows. Cool. When will the Windows GS Creator 0.10.0 upgrade be available? Bundle identifier must start with 'com.' This is a requirement by many Android stores. You cannot drag images directly into GS. You need to now hit the +sign and add the images manually. Bug or improvement? 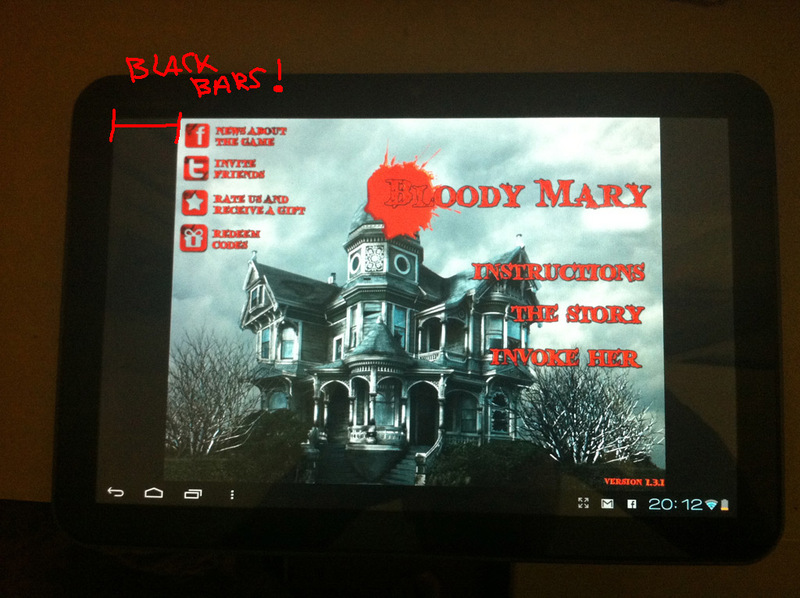 Just compiled using 0.10 for Android and Black Bars persists in my Motorola Xoom (Android 4.0.4). The only workaround for this issue is use 0.94 (the last build that works properly) and now you are saying the old publish servers will shutdown soon? That's bad! When publishing, the notice that says "...be sure to fill in the App Store URL to promote your game on Arcade." What does that mean? It appears under all the platforms, how does it get promoted if we're not uploading to the arcade? Is there a date you guys have in mind for shutting off the prior form of publishing? I'm reluctant to upgrade at this moment. Has anyone else not been able to publish because of publish request d2ba6148-d1fe-4484-bb6e-b4072a8acf73 ? Same problem here, I also can't sign the game and you? In keeping with Apple's requirements, after our next official release we will no longer support Snow Leopard or older OS's. This also means that all 32 bit support will be dropped, and users must utilize a 64 bit processor going forward. As this is Apple mandated, we hope that you understand the necessity behind this change, and we apologize for any inconvenience this may cause. So I was under the assumption Snow leopard support was dropped with this release. But here it says next release. Can anyone confirm which it is and if its working on Snow Leopard? @RacetotheMoon - 30 days from today is the cutoff. Really don't know (mine is nl. ) It's not 'bug' free I think. Generate only work once and then they had a problem with the server so? ?